We haven’t paid a lot of attention lately to alternative crypto coins that are mined only with CPU with no GPU, FPGA or ASIC miners, so we’ve decided to check what is going on with Coin Magi (XMG) as we haven’t been following it actively the last few months. Coin Magi is a PoW and PoS coin that is currently being traded for a little over 2000 satoshi per coin, it is being traded on multiple altcoin exchanges including some of the largest ones, though the trade volume at the moment is pretty low and there are multiple pools where you can mine the coin if you do have some spare CPU power available and you are wondering what to mine. Coin Magi (XMG) uses the M7M algorithm and besides CPU mining and staking coins you can also rent mining rigs at the Mining Rig Rentals service. Last year we have tested the most up to date miner available for XMG – the Wolf0 m7m v2 cpuminer on an Intel Core i7 5820k CPU and now we have retested again in order to compare it with a more recent release in the form of a dedicated m-minerd for XMG (source) that is based on Wolf0’s code. The 32-bit version is significantly slower, so we do recommend to go for the 64-bit miner for best performance, but interestingly enough we are getting slightly less performance for, the new miner. The advantage that the new m-minerd miner for the M7M algorithm has an option for that allows you to set the percentage of CPU usage you want the miner to take. Coin Magi (XMG), the altcoin you should be mining if you have some spare CPU power, has launched their 2nd Proof of Mining campaign. An incentive that tries to award with more coins people that do not have too much hashrate, but still want to get more out of their CPU mining power. The idea of this campaign is to encourage people to continue mining even if they have low hashrate or the block reward is not that high by giving them extra bonus coins – the longer you mine the higher the bonus will be. The 2nd PoM campaign will have a duration of about 2 months and you need to register to participate and use a special dedicated pool where you have to mine in order to get the extra reward apart from the mined XMG block rewards. 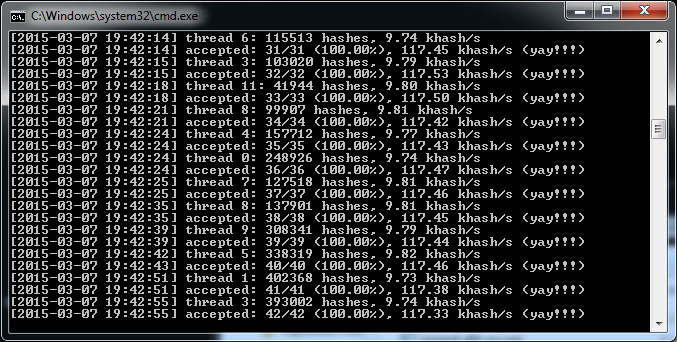 Do note that the total hashrate you can mine with in order to participate int he campaign should not exceed 250 kh/s. We are closely watching the Coin Magi (XMG) development as for the moment it is still pretty much the most actively developed alternative crypto currency that continues to be mineable with CPU only and there is no GPU miner for it available. The developers just recently announced the release of MagiPay, a Standalone Payment Gateway for Coin Magi. The ongoing development as well as the wide accessibility due to CPU mining is important as it allows pretty much anyone to be able to mine XMG on his own computer, though based on the processor used the results in terms of performance can vary. Still the ability to mine the coin on every computer and the fact that you can still mine it even though the current reward per block is lower (variable between 0.0001 mining fee and 50 XMG) that it was initially is what makes the coin attractive to a wider audience. Also the fact that the Coin Magi is traded on some big altcoin exchanges such as Bittrex and it has a pretty stable exchange rate does help to keep the users interest in the coin. There are currently five pools where you can mine XMG directly and a multipool where you can get paid in XMG. 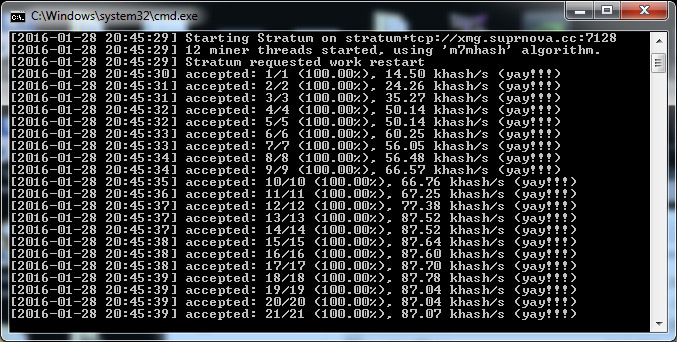 To test what hashrate we are going to be getting on a modern high-end CPU we have tested the highest performing CPU miner available for mining XMG from Wolf0 on an Intel Core i7 5820K processor running with 12 threads on this 6-core CPU with Hyper Threading support. We have tested all the various optimized binaries of the miner on that processor to see what results we are going to get with each one and which one hash the highest performance, you can see the results below and you can also download the miner to try out on your processor from the link below. Interestingly enough the difference in terms of performance between the lowest performing and the highest hashrate version is in the range of just about 2 KHS which is not that much. Another interesting find is that apparently the generic version of the miner does manage to get the best results on the 5820K CPU (Haswell-E) processor.